New Improved! The Edge 540T Version 2 features our new brushless 3600kv motor with 4:1 ratio gear drive for 30% More Power, New 11x4.7 "No Flex" Resin Prop and Larger Battery Bay to hold larger capacity Li-poly batteries. Advanced Li-poly 2 and 3 cell balanced peak charger included with variable charge rate. Comes with A/C adapter. 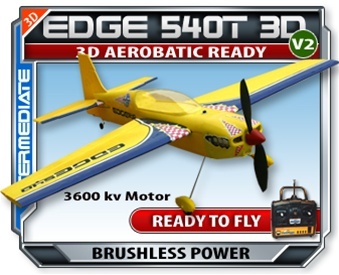 The Edge 540T 2 is a 100% true scale Ready To Fly full 3D r/c aircraft. Capable of limited vertical performance, hovering, harriers, knife edge, rolls , inverted flight and much more. Included everything needed to fly: 2.4 Ghz Radio and Rx, 3 cell 11.1 volt Li-Poly 1800 mah battery, 90 Minute balanced peak charger, 3 Servos, Speed Control, all pre-installed from factory. Edge features plug and play construction for easy maintenance and dis-assembly. Kit comes fully sticker-ed as seen in photo. 2.4GHZ - 4 Channel radio system. The benefits of a 2.4 Ghz radios are unlimited channel selectivity with no chance of any interference at all. 20 Minute run times due to large capacity 1800 Mah Lipoly battery. * Complete "Ready To Fly" Kit has everything you need to start flying in one box! * Includes a 3 Cell 11.1v 1800 mah Li-Poly Battery! * BONUS!! 2 and 3 Cell Auto Balanced Peak Charger Included!!! Specifications- Radio: 2.4Ghz Radio and Rx, Battery: 3 cell Li-Poly 1800 mah, Motor: Brushless 3600 kv Inrunner, Wingspan: 36.6", Length: 33.1", Weight: 20oz, Range: 3,000 ft, Flying Time: 20 Minutes, Battery Charger: 3 cell 90 Min. Balanced Peak Charger. * Complete "Ready To Fly" Kit has everything you need to start flying in one box! * 3D Aerobatic Ready! * Brushless inner runner 3600kv motor with gear drive! * Includes a 3 Cell 11.1v 1800 mah Li-Poly Battery! * BONUS!! 2 and 3 Cell Balanced Peak Charger Included!! !